This page on ring network vs bus network describes difference between ring network and bus network. There are many different ways stations(i.e. nodes) can be interconnected to form a network. However there are several popular configurations which are used again and again for this purpose. These configurations are known as network topologies. These popular network topologies are star, ring and bus. Following sections describes ring and bus network basics mention the difference between ring network and bus network. Figure-1 depicts ring network configuration. As shown in the figure there is no central controller station due to the fact that each station performs some control funtionalities. All the stations are connected end to end to form continuous loop. This results into each station having connection with two other stations one on left and the other on right. Stations(i.e. nodes) in the ring network can send as well as receive. All the nodes have capability to receognize their assigned address as well as retransmission of the received signal. The message to be communicated between nodes starts with address of the destination node followed by actual message. • The originating node sends the message to the next node in the line. • As the communication in the ring network is unidirectional and hence if the message is not belong to the receiving node by checking the address, it will simply sends the same message to the next node in line. • When the destination address matches at the receiving node, it will receive/decode the message and hence communication is said to be complete. In this type of network, all the stations effectively share a common cable known as bus. Communications is bidirectional on the bus i.e. any one station can talk to any other station. • Here sending station effectively broadcasts the message on the bus. • All the stations can receive the above message. • The station for which the message is meant for will decode the message. Hence communication is said to be complete. ➤A bus network can be more reliable compare to a ring network as its highway can be passive. 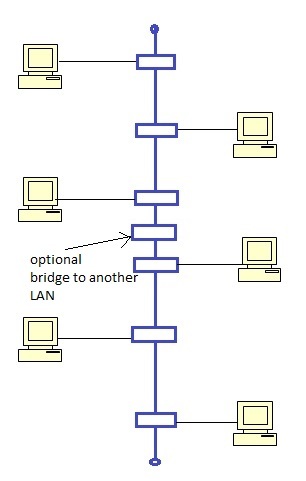 Hence failure of one or more nodes does not interrupt service for the other nodes in bus network. While in ring network failure of one node disables the entire system. ➤Any extra additional nodes can be added to a bus network without disrupting the network operations. While in ring network, any extra nodes can be added after bringing the network out of service. ➤A bus network uses coaxial cable or twisted pair due to the need to transmit in both the directions. Hence bidirectional optical couplers are used to tap in optical fiber bus network. ➤Bus networks suffer due to signal reflections at impedance irregularities. Hence impedance mismatches at the nodes as well as at the ends need to be avoided carefully. ➤Isolation of fault is difficult in the bus network, while it is easy and straightforward in the ring networks. 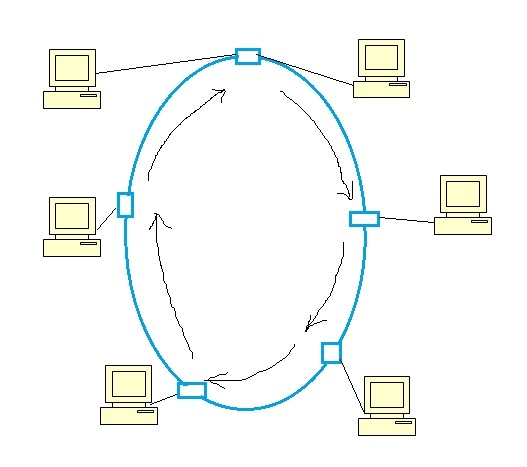 ➤ Ring network provides slow speed of access since nodes are accessed sequentially. Bus network provides fastest speed due to direct access. ➤ Ring network cost is lowest among all the topologies. ➤ In Bus network any two stations wanting to communicate with each other will directly communicate without interference or assistance from any other stations or nodes.